If y'all follow me on my tweets/instagram you should know by now that I am currently in Melbourne! Anyways if any of y'all in Melbourne, or gonna be in Melbourne anytime soon and would wanna party the night away, do come over and check this out an event specially brought to you by Puzzle. Puzzle Events presents a BIG ONE OFF PRE-EXAM PARTY! BACK TO THE FUTURE Feat. HYPEEMBEATS X JEEHOE & B.A.T.E (ETHAN CURZON) DIRECT FROM MALAYSIA! ZOUK RESIDENT DJS comes to MELBOURNE for one night! 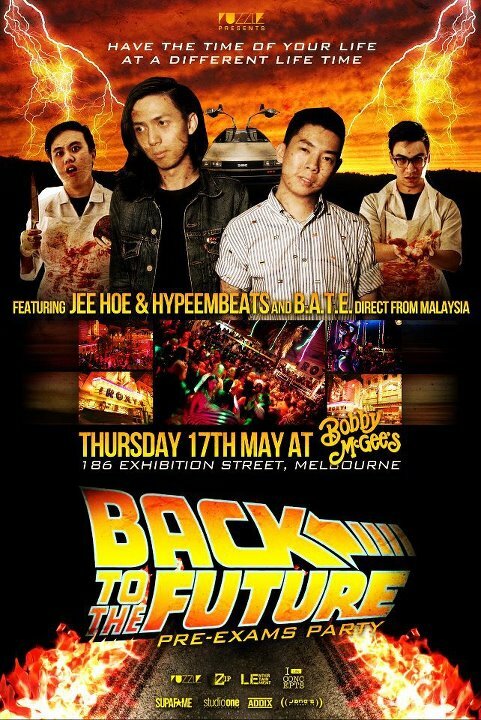 Thursday 17th May 2012 at One off Melbourne's Valuable Gem Venues! Bobby McGees! Come and party at this big ONE OFF EVENTS planned to bring you back to the future! With 90's decore, this is one venue and night you dont want to miss! Come over and we'll party the night away. Great venue, awesome music & goooooood company. Well this is the one night where we plan to take you on a whole new level of clubbing! Bobby McGee's Entertainment Lounge was an institution in Melbourne in the early 90's that successfully operated for nearly 13 years. With it's amazing décor and 3D themeing of a bygone era, it still blows people away today when they enter the room. The venue has a capacity of over 500 people, with three bars, Beach, Roxy and Mobil - all themed. An amphitheatre style dance floor with state of the art lighting and sensational sound system flexible enough to provide whatever live music it is you desire, a 3am licence to party the night away, alfresco smoking area, very large cloak room, an optional chill out room, wheelchair access, and not to mention plenty of restrooms. Bobby Mcgees is located on Exhibition street, in chinatown! Great location and perfect spot for this night! Drinks are only $7 for basics all night long! Or head to https://www.facebook.com/events/290382934382019/ for more info.